Happy Motivational Monday! It has been a fantastic (although very busy) week for me. I had an amazing boudoir photo shoot, and rode the Bike the Bridge in Detroit. I'm still doing well with calorie counting, but the weight loss is definitely slowing as I get so close to goal. This week is going to be tough for me, because Thomas will be in town, so we want to take him to some of our favorite restaurants. I'm just going to have to pick and choose what to splurge on and what I'm okay without. I'll be happy if I can just maintain my weight all next weekend. Anyway, here are some inspiring stories for Motivational Monday! In 2012, at age 27, Hannah was told by her doctors that she had just SIX WEEKS to live. She was diagnosed with esophageal cancer, and felt like the entire world just stopped spinning. She went through intensive chemotherapy, and endured nine weeks of it before her surgeon performed a major operation--removing most of her stomach and her esophagus. She then went through another nine weeks of chemotherapy. She started working out again when her doctors gave her the okay, and even started training with a local triathlon club. 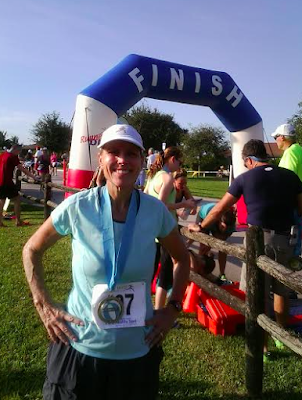 Three years later, she has done things that she thought were impossible: she's completed a duathlon, a triathlon, turned 30 years old, and last weekend, she completed her first half-marathon! 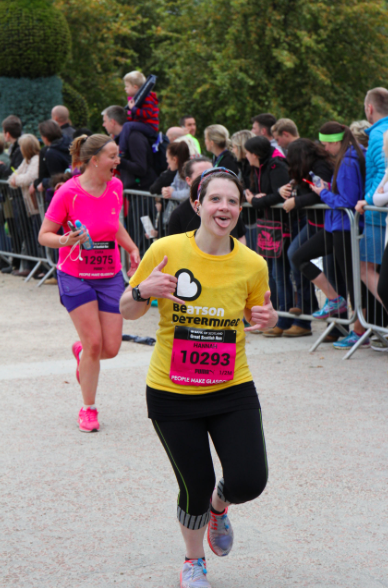 She finished in 2:31, well under her goal of 2:45, and raised money for the cancer hospital she went to for chemo, The Beatson in Glasgow, U.K. In January of this year, Taryn sustained a life-altering injury when she dislocated her knee, tearing the main artery supplying blood to her lower leg. It took almost 12 hours to get the blood flowing back to her leg--she had lost half her blood volume, her kidneys shut down, she nearly lost her leg, and even worse, was close to dying. 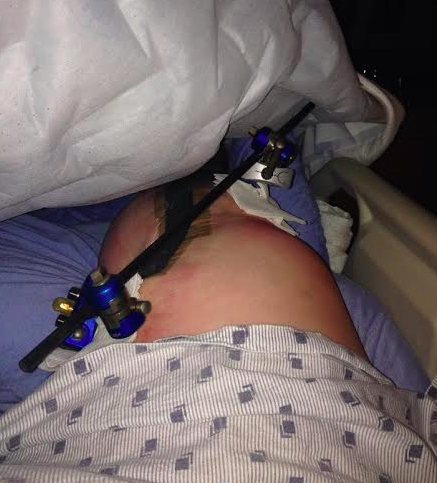 She spent over two months in the hospital (four days in the ICU, four weeks of complete bed rest, and six weeks total with the metal rod (in photo) in place. She took her first post-injury steps on March 3, which happened to be her birthday. This week, she is proud to say that she has returned to the gym, and is now working with a trainer to get her strength back up. She's counting calories, and the weight is starting to go down. Her doctors predicted she'd be out of work for a minimum of a year, but she's going back at the end of this month, less than 10 months after her accident. She's worked very hard to get to the place she's at now, and she is proud that she hasn't given up on herself! Phyllis is a runner, and in 2006, completed a half-marathon (which would be her last for several years). She was side-lined from running due to sciatica, but she took a couple of years to get well. 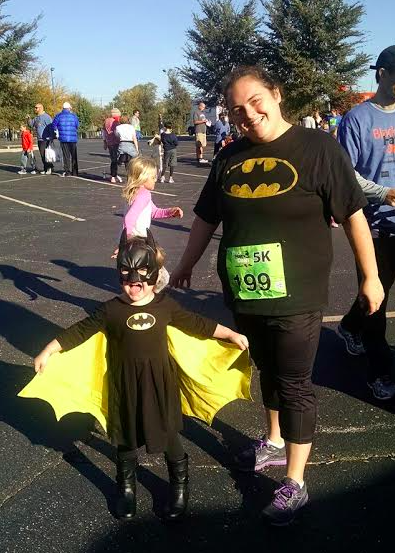 In November 2014, she ran another half-marathon, which sparked a new goal. She decided that she wanted to run a half-marathon each month for a year. Yesterday, Phyllis completed her 12th half-marathon in 12 months! Most of the races were in Florida, but she even traveled to Chicago and Atlanta to race. She turned 50 in May, so she is proudly celebrating these accomplishments! As always, I am super inspired by your stories, ladies! Congratulations on your accomplishments! Oh my gosh! So many feels in this week's post! So many strong and awesome ladies! You all are an inspiration for what you have gone through and overcome. Every. Single. One. Wow! Ladies, you are all so inspiring. I wish good health and speedy races to all! Amazing folks this Motivational Monday! Great job all! Wow. These stories are incredible. Work it OUT ladies, you all are truly amazing! This is...just...I have no words enough to describe my pure and sincere admiration! Thanks for sharing these three inspiring stories Katie, it puts my life in a whole different perspective. WOW! Lots of inspiration in these posts today! Thanks for sharing, ladies!!! Great motivational stories this week! I hope to have one for you after April - hoping to hit a half-marathon PR then! Such inspiration this week! Way to go everyone! These stories are amazing. This really was a motivational Monday. I feel like these inspiring ladies just dropped an atom bomb on all my excuses for not running! Thank you it's great motivation!